I know you don’t want to hear this, but it’s already July. And, unfortunately, that means we’re already over 6 months into the first performance year for MIPS. Hopefully, you’re feeling more comfortable with basic MIPS requirements. If not, check out these additional blogs (here, here and here), plus our webinar. But, assuming you’ve got the basics down, you’re now probably wondering how all that reporting translates into your payment adjustment. Well, you’ve come to the right place. No big surprise here, but MIPS scoring is extremely complicated. I’ve broken it down to the simplest explanation I can muster, but that still involves a few separate blog posts. In this post we’ll discuss the fundamentals of MIPS scoring, as it applies to registry reporting, since pMD is a CMS certified MIPS Registry. Keep an eye out for the next installations of this post, where I’ll explain each individual MIPS categories’ scoring guidelines: Quality Scoring (Part 2), Improvement Activities Scoring (Part 3), and Advancing Care Information scoring, tying it altogether with an overview of the MIPS payment adjustment calculation (Part 4). Got it? Then, Ready? Set. Go! 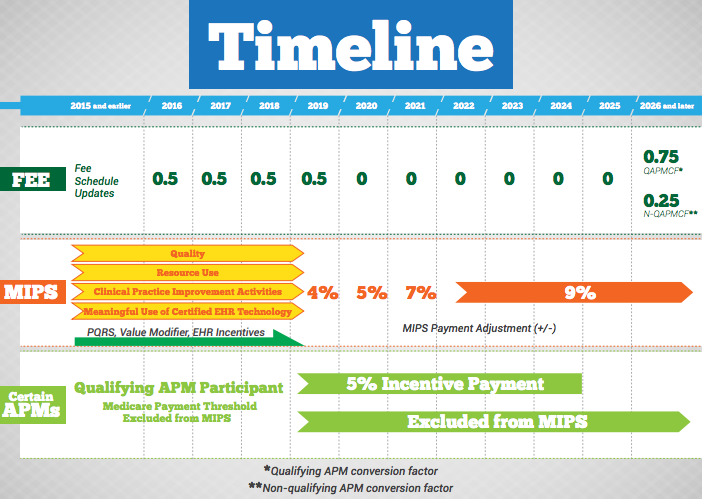 At the end of the day, the piece of the MIPS puzzle that everyone is most interested in is the payment adjustment. 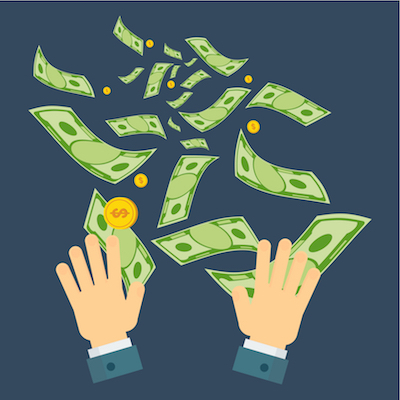 The payment adjustment determines how much of your money CMS will keep and, ideally, how much additional payment you will receive from CMS. Your MIPS payment adjustment is calculated based on your MIPS final score. So, let’s start with how the final score is calculated. What are the basic components of my MIPS Final Score? The final score for the 2017 performance year is composed of three different categories, each of which contribute a certain percentage to the MIPS final score. Quality, which replaces PQRS, contributes 60% of the MIPS final score. Advancing Care Information, which replaces the Medicare EHR Incentive program for eligible professionals, typically contributes 25% of the MIPS final score. 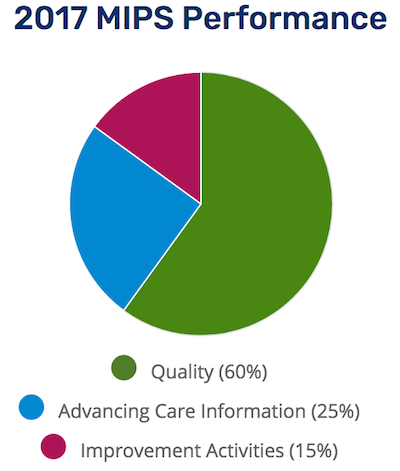 Finally, Improvement Activities, a brand new program from CMS, contributes 15% of the MIPS final score. That means each individual category receives a score, which is then weighted and combined to get the MIPS final score. We’ll look at each individual category’s score calculation in subsequent blog posts, but for now, let’s review some other fundamental questions of MIPS scoring. 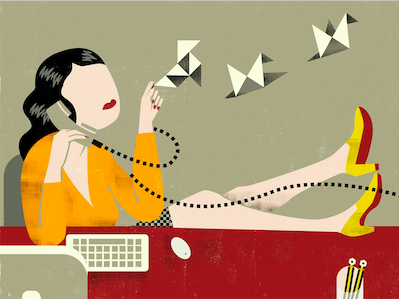 Is my payment adjustment applied to all of my billing? Or just to my Medicare Part B billing? Even though MIPS requires that you report measures on all your patients – not just your Medicare Part B patients – your MIPS payment adjustment is only applied to your Medicare Part B billing. Phew! What year will my payment adjustment be applied to? MIPS payment adjustments are applied two years after the performance period. That means that any payment adjustment you earned in the 2017 performance period will be applied to your Medicare Part B billing in 2019. Whose billing is the payment adjustment applied to? For MIPS, the payment adjustment will be applied to the billing of the TIN/NPI, no matter how the TIN/NPI reported data during the performance period. For registry reporting, a practitioner can report either as a group or as an individual. But, no matter which method you choose, the payment adjustment will be applied to your individual TIN/NPI’s Medicare Part B billing. What happens if I change employers, or if my TIN dissolves? For MIPS, the assigned payment adjustment will actually follow the NPI – no matter what TIN is associated with your NPI’s billing. This is a huge change from PQRS, and while it has concerning implications, it also closes one of PQRS’ biggest loopholes. What if I bill under multiple TINs? If all of your TINs participate in registry reporting, where the only two options for reporting are either individual or group, then only the highest score will be applied to the NPI. So let’s say you moonlight at a hospital that collects and submits MIPS measures on your behalf. This submission will generate one MIPS score associated with your NPI and the hospital’s TIN. If you also have a daily primary care practice, and submit MIPS measures for your private practice, you will receive a MIPS score associated with your NPI and your private practice’s TIN. For the payment adjustment, CMS will apply whichever score was higher to both TINs associated with your NPI. Ok, now you’ve got the fundamentals down! Stay tuned for Part 2, where we’ll discuss how the Quality and Improvement Activities sections are scored. And as always, if you have any questions or would like to find out more about our MIPS registry, give us a call! To find out more about pMD's suite of products, which includes charge capture, secure messaging, and care coordination software and services, please contact pMD. Components of MIPS Final Score: “We are finalizing that for the first MIPS payment year (2019), the quality performance category will account for 60 percent of the final score and the cost performance category will account for 0 percent of the final score…” See https://www.federalregister.gov/d/2016-25240/p-3803; see also Table 29 in the Final Rule https://www.federalregister.gov/d/2016-25240/p-3804; see also 2017 MIPS Performance graph at https://qpp.cms.gov/mips/quality-measures. The MIPS payment adjustment from the 2017 performance year will be applied to 2019 billing: “Further, we are finalizing our proposal to use performance in 2017 as the performance period for the 2019 payment adjustment. Therefore, the first performance period will start in 2017 and consist of a minimum period of any 90 continuous days during the calendar year in order for clinicians to be eligible for payment adjustment above neutral. Performance in that period of 2017 will be used to determine the 2019 payment adjustment.” See https://www.federalregister.gov/d/2016-25240/p-160. Even when reporting as a group, the MIPS payment adjustment will be applied to the individual’s TIN/NPI billing: “A TIN/NPI may receive a final score based on individual, group, or APM Entity group performance, but the MIPS payment adjustment would be applied at the TIN/NPI level.” https://www.federalregister.gov/d/2016-25240/p-3871. The MIPS payment adjustment will be applied to the NPI, even if the TIN changes between the performance year and the payment year: “[W]e are finalizing our policy to use the TIN/NPI's historical performance from the performance period associated with the MIPS payment adjustment, regardless of whether that NPI is billing under a new TIN after the performance period.” See https://www.federalregister.gov/d/2016-25240/p-3908. If an NPI reports under multiple TINS, the highest score associated with the NPI will be used to determine and apply the MIPS payment adjustment: “Therefore, we are finalizing our alternative policy to use the highest final score associated with an NPI from the performance period.” See https://www.federalregister.gov/d/2016-25240/p-3901.